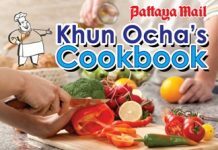 Home Lifestyle Khun Ocha's Cookbook Oyster Shots with WOW! Jameson’s Irish Pub some time ago had an oyster shot recipe, which made me remember that I had a somewhat more potent version in my own files! Warning! Don’t let the children try this at home! It does call for freshly shucked oysters, but bottled oysters are quite suitable (just don’t tell anyone!). In a medium bowl, combine the tomato juice, red bell pepper, shallots, coriander, and parsley. Pour one tablespoon of the tomato juice mixture into each of the 12 shot glasses over the oysters. Pour the tequila into a cocktail shaker with ice cubes and shake to chill the tequila. Add about two tablespoons of tequila to each of the shot glasses. Serve immediately.